How expensive is bad science? In 2000, when Houston surpassed Los Angeles in the number of “high ozone days” for the first time, the Texas Commission on Environmental Quality (TCEQ) submitted their State Implementation Plan (SIP) for reducing ozone to the Environmental Protection Agency (EPA). The plan included a ban on all lawn mowing before noon in the Houston area. Initially the ban-related language applied to everyone, however, after reviewing comments from various stakeholders, it was limited to commercial lawn and garden companies. The word “commercial” was defined as any individual or business that generated more than $400 USD annually mowing lawns. In 2004, the proposed ban was rescinded by TCEQ before it was ever implemented. Why? Was it because of concerns about possible health problems given that individuals could only mow lawns during the hot, humid summer afternoons (when ozone levels peaked)? Or, was it because a disproportionate number of lawn and garden companies were minority-owned thus would share an inordinate burden for reducing pollution? Or, perhaps, it was attributed to something else? The main reason it was rescinded was that air quality studies indicated that the proposed lawn mowing ban was based on bad science. The New Science. In 2000, an extensive air quality study was carried out in the Houston area. Over 200 scientists were involved, with research funding of more than $20 million USD. Extensive testing suggested that emissions of volatile organic compounds (VOCs) from refineries and chemical plants were vastly underestimated. A number of scientists said reported emissions were “only” a factor of three to 10 times too low, although others said the number could be as high as 100. Of particular concern were emission events that caused ozone spikes and the “highly reactive” VOCs (HRVOCs), which can form ozone roughly 10 times faster than other VOCs. This new information changed the shape of the problem. As a result, the petrochemical industry negotiated with regulators and formulated a new plan that would reduce nitrogen oxides (NOx) by 80 percent rather than the 90 percent figure as originally proposed. The industry, however, would significantly reduce VOCs, especially HRVOCs. In the process the ban on lawn mowing (which targeted reducing NOx during the morning hours) was removed. The Results. The new science-based plan worked. Ozone levels dropped dramatically. In 2006, when the 2000 air quality study was repeated, HRVOC emissions had dropped by 40 percent. However several different researchers found that the measured HRVOC emissions were still 10 times higher than the reported values. 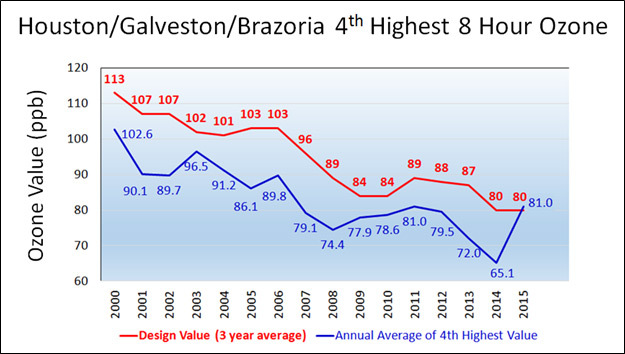 The red line in the plot below shows the design value (a three year average used to determine compliance with EPA regulations) has declined dramatically, and that the 1997 standard of 84 ppb has been met; however, the Houston area has not met either the 2008 standard of 75 ppb or the recently enacted 2015 standard which is 70 ppb. The blue line in this chart shows the one-year averages of the fourth highest values of all regulated monitors (2015 shows a significant rise in ozone levels across the Houston area). Changing weather is usually the largest cause of year-to-year variations. Could other factors like an increase in industrial activity due to low cost fuels flowing in from the Eagle Ford Shale and other oil- and gas-producing areas have an impact? Perhaps, although it’s too early to quantify specific impact. Annual variations are certain to continue, however, since the ozone values in 2015 were high at many different monitors, it’s unlikely that the Houston area will meet the 75 or 70 ppb standards in the near-term. The state of Texas will be submitting a new plan for reducing ozone to EPA. What will Texas propose: another ban on lawn mowing before noon? Where does pollution come from? When states submit their plans for reducing ozone to the EPA, they must show where the ozone precursors (VOCs and NOx) originate, and estimate what percentage rate that ozone levels will decrease after proposed VOC and NOx reductions are in place (based on highly complex air quality modeling). The last proposed plan for the 2008 ozone standard indicated that about 17 percent of all VOC emissions in the Houston/Galveston/Brazoria area originated from point sources like refineries and chemical plants. However, as was mentioned previously, in 2006 several studies suggested VOC/HRVOC emissions were roughly 10 times higher than reported. One of those research methods, Solar Occultation Flux (SOF), has been repeated in 2009, 2011 and 2013. In the most recent report (2013), the SOF measurements indicate that HRVOCs have decreased by approximately 60 percent, however, again, the emissions of all VOCs, including HRVOCs, are five to 10 times higher than reported. 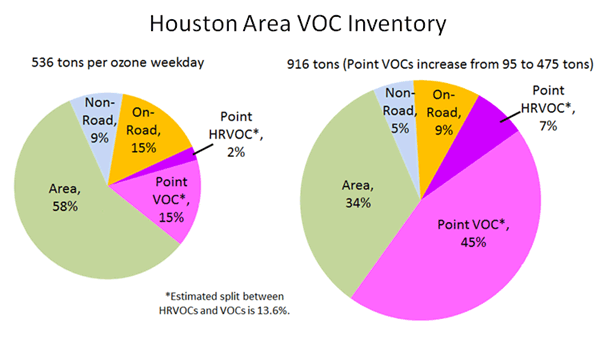 If the reported point source VOC emissions were multiplied by five to match the measured values, then point source VOCs would make up 52 percent of the total inventory. The TCEQ ozone plan that addressed the 2008 standard reported that there were 536 tons per day of VOCs in the Houston metropolitan area. However, if point sources were adjusted by a factor of five (as implied by the SOF data), then the overall total rises to 916 tons as shown. If regulators use the inventory as shown, they will (incorrectly) place the primary focus on area and mobile (on-road and non-road) emission sources. Another problem is that if VOCs are significantly underestimated then the model results will be skewed in ways that are difficult to predict, including understanding how much effort should be placed on reducing VOCs versus NOx. Getting Back to the Science. In the early 2000s when refineries and chemical plants reduced NOx emissions by some 80 percent, and also substantially reduced HRVOCs and emission events, the actions resulted in a substantial reduction in ozone concentrations. Even so, Houston still needed additional reductions to comply with the national ozone standard. Only two techniques, SOF and Differential Absorption LIDAR (DIAL), were identified by the European Union in 2014 as “best available technologies” for measuring VOCs from refineries and chemical plants. In 2015, the South Coast Air Quality Management District performed verifications (using known releases in blind tests) that showed DIAL accurately measured VOC emission rates at every level tested. The SOF measurements were proportional, but consistently underestimated (not overestimated) emissions by about 30 percent. Houston performed SOF studies in 2006, 2009, 2011 and 2013—more than any area outside of Sweden—and consistently showed measured emissions at least five times higher than reported. Although emission factors and other estimating techniques can work for equipment that is operated and maintained properly, SOF and DIAL can provide the auditing function that is needed to identify where reported emissions are not in line with measured emissions. However, regulators generally don’t require either SOF or DIAL because companies all over the world have invested trillions of dollars building facilities based on permits that use EPA emission estimating methods. Many agree that if the EPA or others tried to change the rules they would become entangled in never-ending litigation. No Good Deed Goes Unpunished. The drivers for voluntarily finding actual emissions with measurements are limited. A company would need to spend more than $100,000 USD for a SOF study and more than $300,000 USD for a DIAL study. Both techniques are two to three orders of magnitude more sensitive than an IR Camera although their use is likely to bring about bad news. Equipment that is leaking high levels of VOCs that was unknown previously would be costly to fix and could result in fines and other penalties. The potential liability is too high for companies to fund SOF or DIAL studies since legally neither is required and the results would more than likely put them add odds with regulators. Inaccurate emissions estimates, however, force people worldwide to develop inventories, work with complex models, identify controls, and set regulations based on bad data. The end result: a tremendous amount of wasted time and money to create control strategies that are not optimal and may ultimately be ineffective. The Solution. One proposal is to retain an independent company to use SOF while driving down the Texas coast from Port Arthur to Corpus Christi, taking measurements downwind of the refineries and chemical plants. Every quarter the company would post and publicize the results, and, importantly, include the top ten offending areas where measured VOCs are highest relative to what is reported to the agencies. The upwind facilities would begin by checking their facilities with standard leak detection and repair equipment and IR Cameras. If SOF results continued to find high VOC readings, the facilities would hire the same independent company to take SOF measurements inside or, if needed, perform a DIAL study. This would create a “find and fix” atmosphere that would bring down VOC emissions—targeting the areas where the emissions are highest. Reducing VOCs in this manner would bring down concentrations of ozone and air toxics. What Happens with No Solution? If bad science (emission factors and emission estimates at point sources that are never audited or corrected) continues to be used to create ozone control strategies, there will be a high price to pay. It may mean that one day everyone will be mowing their lawns in the hot, humid heat of a summer afternoon, when ozone values are at their peak levels—and, for no good reason. Or, it may mean that businesses will be required to implement new, expensive pollution controls that will be relatively inefficient in terms of reducing ozone. And, for those who suffer from asthma or other lung-related disease, ineffective emission controls could literally become a matter of life and death. Perhaps, in the ozone reduction plan addressing the 2015 standard, Texas will submit new proposals to reduce additional VOCs/HRVOCs from petrochemicals, as the state did in the early 2000s. This action would help the Houston area—but what about the rest of the state and, importantly, the rest of the world? One of the best gifts Texas could afford itself—and provide to the rest of the world, for that matter—is cost-effective policies based on the best science available. Alex Cuclis is a research scientist, air quality & emissions at HARC (Houston Advanced Research Center). Cuclis works closely with the Texas Commission on Environmental Quality (TCEQ), the Environmental Protection Agency (EPA), and air quality researchers at universities, environmental firms, and government laboratories. Cuclis earned a B.S. in chemical engineering from the University of Texas at Austin, an M.S. in analytical chemistry from the University of Illinois at Urbana-Champaign, and an M.S. in behavioral sciences from the University of Houston, Clear Lake. For more information, follow HARC @HARCresearch.